Starters for the 18/19 Season? This is a rough estimate of who would occupy starting positions in the team and who would fill the immediate backup roles. I left out players such as Denayer, Sandler, Mangala, Diaz, Roberts, and Zinchenko as it is unclear how much they could play in the upcoming season – though it’s possible they have important roles, so please remember to consider them. Positions such as central defender or winger are less clear than others, with the projected backups possibly taking a starting position over who I have listed above them. Once Mahrez learns Guardiola’s system it is highly likely that he takes the right winger position for himself. Pep Guardiola’s strategy in games is to press high immediately when his team doesn’t have the ball, and to build-up under any pressure when his team does have the ball. If the pressing gets broken and the team is pushed deeper, they look always for pressing triggers to begin high pressing again as soon as possible. If they manage to win the ball with their pressing, direct counter-attacks with speed are always an option with the pace of his strikers – but the team is also aware that they can always play backward to begin a new possession. If City’s build-up with the goalkeeper breaks the opponent pressing, they can play immediately behind for chances or the opponent drops deeper to protect their goal and City begin to attack the low block. If possession is lost, the distances between the players are close enough so that they can immediately press to continue their positional attack while the players who cover the counter-pressing are in narrow positions ready to control the counter-attacks. Because his teams take the ball immediately and make it very difficult for the opponent to take the ball from them, his team forces the opponent into a reactive role while his team dominates the game. Due to the quality of his players, his dominating strategy, and the era of football which his team exists (with opponents who are more often willing to be reactive rather than proactive), it becomes a very frequent occasion that his players have to unlock low and compact defenses in the opposition penalty box. One of the most common structures the team came across last season was the 5-4-1-0 (“-0” means that the striker is not pressing the defenders whatsoever and acting more like another midfielder, therefore leaving 0 strikers in the front). 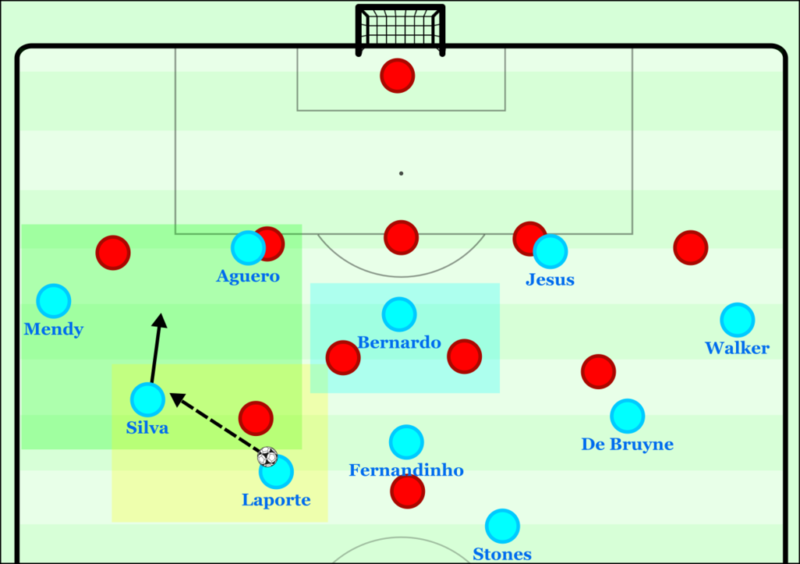 Guardiola’s overall strategy has been detailed above, and for the purposes of this piece, the most important phases become the possession of the ball and the transition to being out of possession of the ball – meaning how his team attack in possession and how they control the counter-attacks of the opponent. Now let’s look at more detailed tactics within this strategy and within these phases of the game. 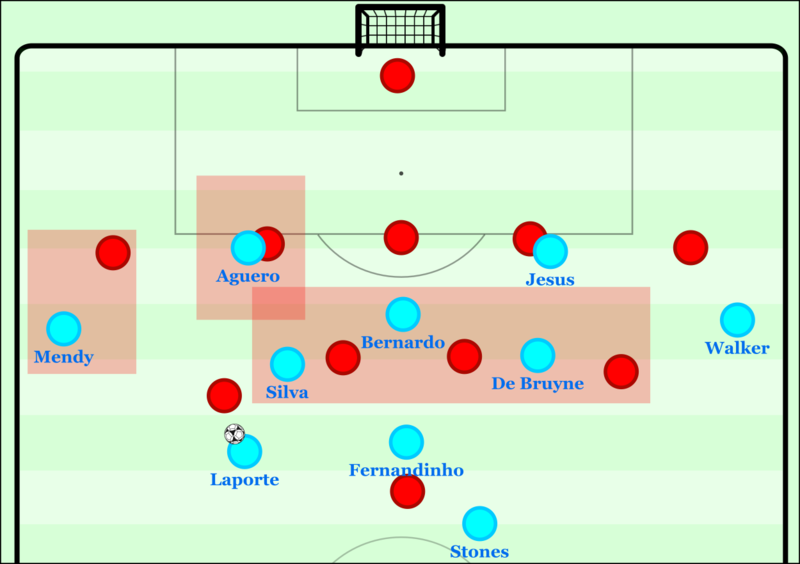 A fundamental idea within a positional approach to possession is to have players occupy offensive zones of responsibility across the entire field and to move within this defined area, as opposed to having players freely roam across the whole field to overload the ball-side while leaving no players on the opposite side of the field for switches or more well-structured counter-pressing. The players should look to position themselves between the opponents in the defensive block in both horizontal and vertical lanes, as well as both inside and outside of the opponent block. While having this detailed spacing, the players should always move within the defined structure toward the ball to offer passing options. Passing options into depth are always the first choice (though this is not as possible against a low 5-4-1-0), passing options to each side of the player on the ball, further passing options between the immediate pass options, and of course, the possibility to play the ball back to safety and re-circulate. The potential pass options should never position themselves too closely to each other, as it makes it easier to defend with only 1 opponent if the distance between 2 players is small – therefore lacking efficiency in the attack. Of course, the main idea is always to progress the ball past the opponent block (whether it is through it or around it) and into the opponent box for a shot. For this it is always important that players have fast and accurate passing, receiving, and dribbling of the ball while teammates off the ball move to get open for a pass or pin the opponent defenders. Pinning opponents is one of the basic and most valuable tools in possession. Imagine vs. an opponent back 4 that you play two high and wide wingers and one central striker. You pinned back the opponent back 4 from supporting their strikers and midfielders because the two central defenders must mark your striker and the two fullbacks cannot push forward due to the wide wingers. 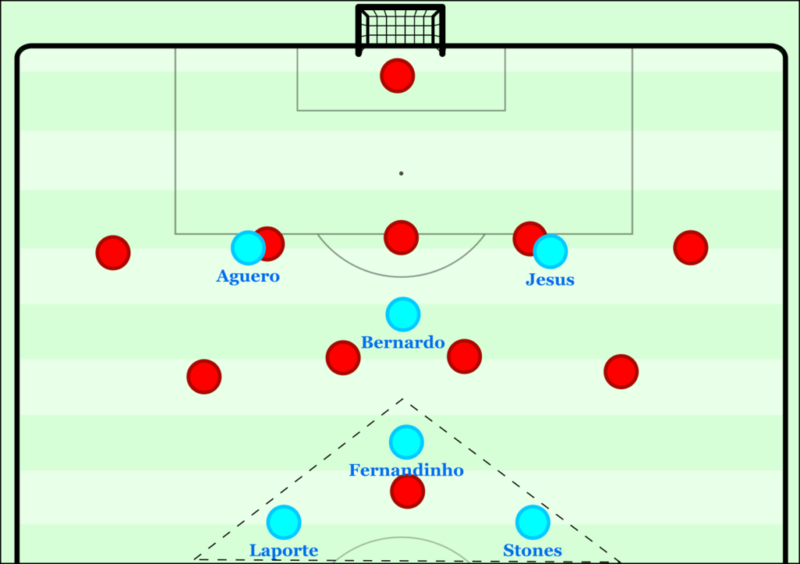 In Barcelona, for example, when Messi played in the central forward position and dropped deeper into midfield to overload the center (the most valuable area of the field to control), Guardiola used Henry and Eto’o moving from wide positions into positions between the fullbacks and central defenders of the opponent – therefore occupying the entire opponent back 4 with just two strikers and allowing for the overload in midfield without defenders following. This is not possible only against the opponent back line, but in other spaces on the field too. As a starting point, a coach will typically think how to pin back opponent defenders in order to deny them the possibility to cover their teammates, and then figure out a method on how to break past the opposing forwards and midfielders to then finally play behind the defense and create chances to shoot. Another useful tool is to then use as few players as possible, as many as needed in the first lines of the build-up. A common idea is to have 1 extra player in the back line than the opponent has strikers in order to guarantee a clean progression of the extra defender dribbling forward into midfield. While this is useful, it can sometimes cause a coach to have too many players in the first lines of the attack and therefore lack midfield presence. Another idea is to use as few players as possible – typically all that is needed is a triangle with two central defenders and 1 defensive midfielder to outplay 1 striker or even 2 strikers (instead of a back 3), then the rest of the players (who are not being used to pin the opponent defense) can find positions to help break through the opponent block. A key quality of a back 5 is that they have 1 extra central defender, the one who is covering for both the outside central defenders. A common mistake when looking to pin a back 5 is to try and pin the covering central defender (we will call him the sweeper for the purposes of this article), while it is not truly necessary. The sweeper has 1 main function, and it is to cover his partners on the side of him – not to press out into midfield or onto the wings. Therefore, if this defender is simply left free he will not be capable of offering much support to his team’s strikers and midfielders. A more efficient approach is to pin the outside central defenders because they are the ones who are allowed to aggressively move out of their positions to cover the rest of their teammates, their ability to cover their teammates must be denied if we are going to create spaces in the midfield. To pin back both of these players, it is most efficient to use two wide strikers who can threaten the wings. So, let’s consider the use of Aguero and Jesus to pin these defenders. Putting in the two pinning strikers. As I mentioned earlier, it is possible to pin other areas of the field instead of only the defensive line of the opponent. This is also possible against the opponent’s forward or midfield lines – it just depends on the number of players within that line. In the midfield of a 5-4-1-0, we have a straight line of 4. This means there are two central midfielders and two wide midfielders. To deny the two central midfielders from easily covering their wide midfielders as the block shifts, the use of an attacking midfielder between these two players would be highly effective. Many players could occupy a #10 position in this team, let’s consider the choice to be between Bernardo and Mahrez – while Ilkay playing in a wider central midfielder role could free De Bruyne or D. Silva to do it as well. Putting in the pinning attacking midfielder. When you put a player in a position to pin the opponent covering, it does not waste their position. It simply makes it easier for other teammates to become free men in midfield, and if the covering player decides to move out to the free man anyway, then the pinning player is free to attack in a higher position. Imagine a central striker and two wingers occupying two central defenders and two fullbacks, when 1 of the two central defenders leave to cover their teammates regardless of the striker’s pinning position, then the striker and both wingers have a 1 vs. 1 situation in a large amount of space to break through. If we follow the principle of using as few players as possible, as many as needed in the first lines of the build-up, two central defenders and 1 defensive midfielder are enough to consistently bypass the 1 striker of the opponent who is focused on man-marking the defensive midfielder. Laporte, Stones, and Fernandinho could fill these roles. Putting in the 2-1 triangle at the base of build-up. To occupy the wingbacks of the defensive line of 5 and fill the principle of maintaining a structure across the entire field, the two fullbacks can push high up the wings. 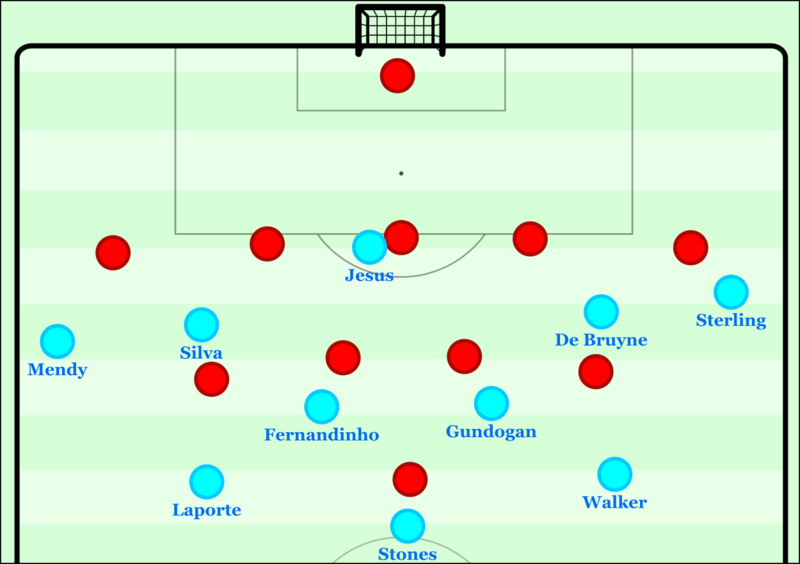 In this case, let’s consider Walker and Mendy for these positions high and wide up the wings because that allows Silva and De Bruyne to play in the middle. Putting in the two high and wide fullbacks. 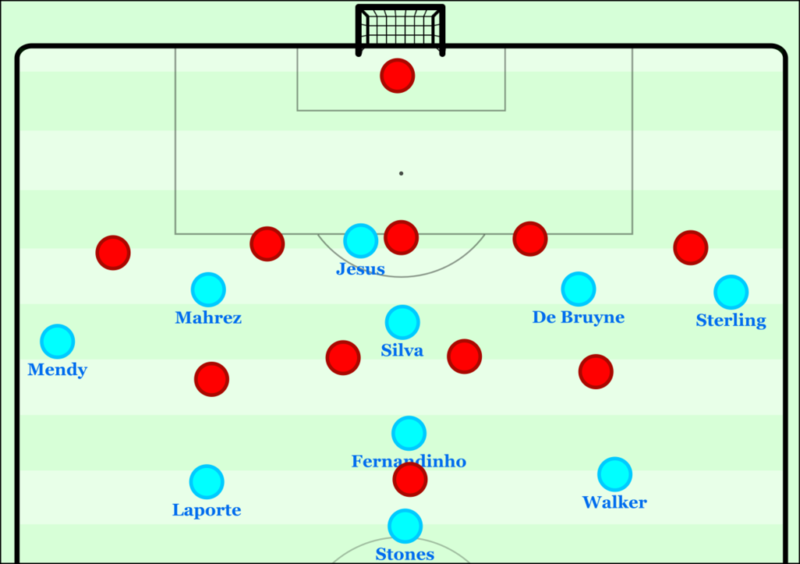 It is also possible that Guardiola could use Sane and Sterling on the wings in possession while the fullbacks push into the middle. This would make it more difficult to play his central midfielders though, as then the team has two wingers, two strikers, two inside fullbacks, two central defenders, one defensive midfielder, and only one attacking midfielder. It is not outside the realm of possibility though. Now we have the back 5 pinned back, the two central midfielders pinned, and the 2-1 triangle in the first lines to have constant forward progression of the ball from the central defenders. The final step is to think where to position the wider central midfielders. You could have them position between the opponent wide and central midfielders on each side so that the central defender can dribble forward at the wide midfielder of the opponent and then play into the wide fullback, the near central midfielder, the attacking midfielder, or the striker. Issues arise when the wide central midfielders are too narrow. This is a bit more difficult though due to the central presence of the 5-4-1-0. The wide midfielder can press the central defender, the near central midfielder covers the near central midfielder on the possession team due to the short distance and the far central midfielder covers the attacking midfielder. The opponent wing back can press the high fullback and the wide central defender can press the striker on the side of the ball. We need to figure out a way to take advantage of the central defender dribbling forward in a way he can find a free teammate once he attracts an opponent. If he is the widest player in the center when dribbling forward and his options are further in the center, it is easier for the opponent to shift across and cover the options while pressure is applied to the ball because the distances between everyone in a crowded center are easier to manage – regardless if one is being pinned or not. The solution? Let’s move the wide central midfielders a bit wider so that when the central defender dribbles forward and attracts the wide midfielder of the opponent, the central midfielders of the opponent cannot shift across to cover the near central midfielder and the attacking midfielder in possession tightly. Now when the wide midfielder presses the dribbling central defender, the wide central midfielder is freed on the outside while the attacking midfielder effectively pins the central midfielders. For these positions, we can effectively place David Silva and Kevin De Bruyne. When using a pinning player, it is most useful to have the rest of the teammates farther away from him – because the pinned opponents then have no possibility to cover the open option without leaving the pinned player with a lot of space to attack! The structure is more effective with wider central midfielders. Now the defense and central midfield is pinned, the build-up triangle has clean progression into midfield, and there is a consistent method to exploit the overload in the middle with the free wide central midfielder who can receive the ball and dribble forward to attack in a 3 vs. 2 situations in the halfspace against the opponent back line. 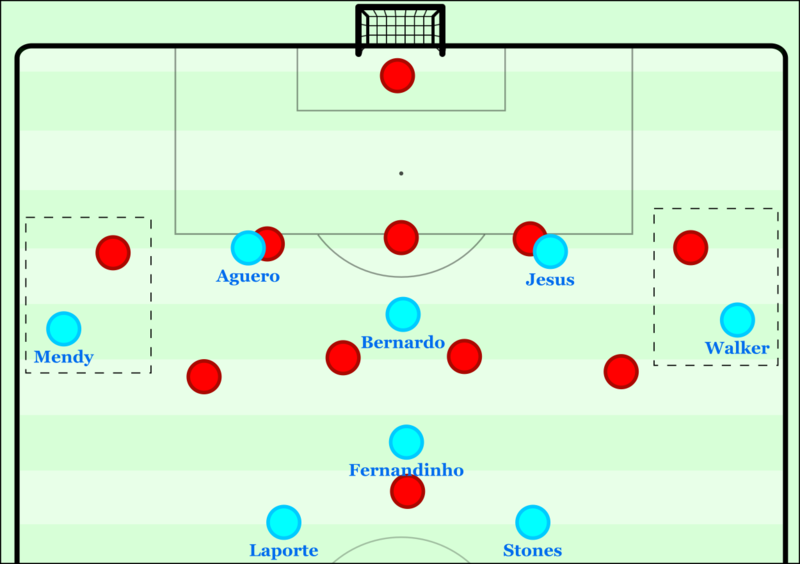 At the same time, the team can maintain a 2-3 structure in the first two lines of build-up as Guardiola prefers to control counters from the 5-4-1. Probable build-up pattern to progress against the 5-4-1-0. In this 4-diamond-2 shape, it is possible to follow the principles in possession mentioned earlier while maintaining stability for the pressing of counter-attacks – in my opinion, this is the most effective system to break down the opponent. Typically, once you pin the opponent’s players and construct the shape of your first lines in the build-up, you are left with your fullbacks, central midfielders, and attacking midfielders to arrange them in different ways to bypass the opposition midfield and attack the opponent back line. Guardiola has shown the flexibility in his career to try different structures in and out of possession to effectively bypass the opponent, so the 4-diamond-2 is possible how I defined it – but also the version with false fullbacks is possible and is probably closer to what the team operates in normally. This is the other system mentioned during the analysis. If you push the fullbacks inside and play with wide wingers a similar structure can be achieved – in a way that can fit the team better. 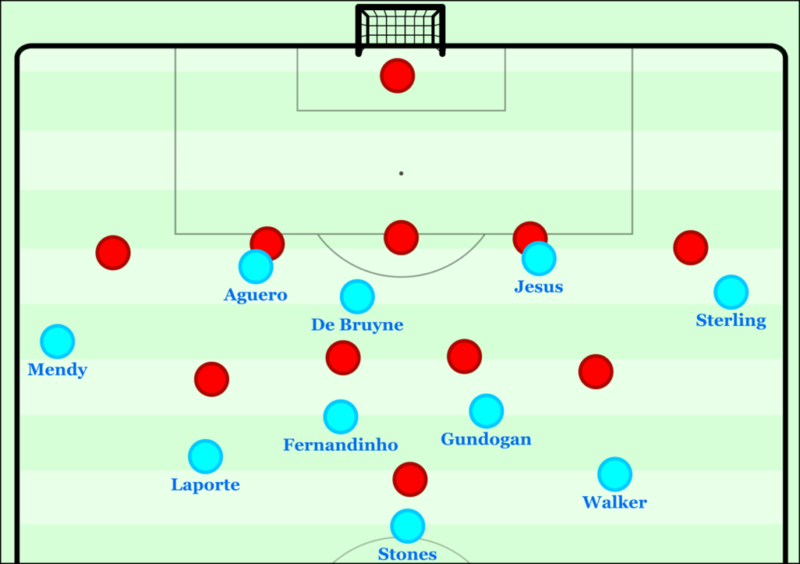 For example, a 4-1-4-1 with Jesus and KDB as the #8s could easily move into this shape. This is the usual system that City use. Problems can arise as there is 1 striker who is trying to occupy the 3 central defenders and nobody pinning the central midfielders of the line of 4. If the central defender dribbles forward it is possible for the central midfielder to press while the wide central defender moves to the attacking midfielder. 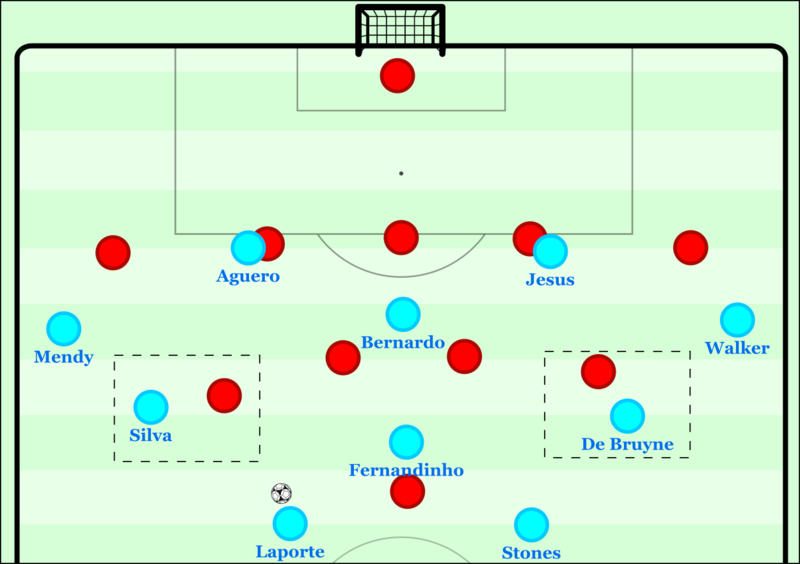 Of course, it is also possible for the attacking midfielder to move very wide and avoid the access of the central defender and central midfielder and attack the wings – but without central presence, this is less effective, Guardiola has used this in the past. A back 3 with Mendy high on the left and Walker deeper on the right. Mahrez could move inside to the halfspace as City then play with 3 attacking midfielders. 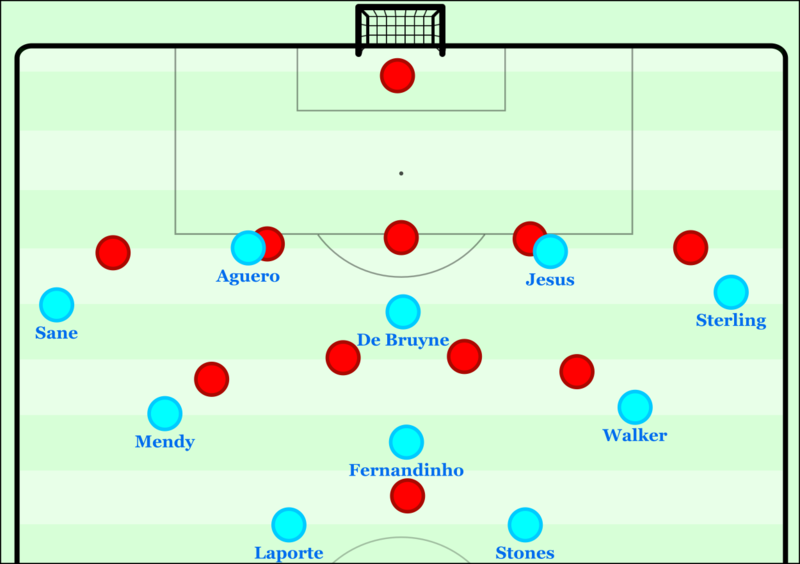 Again as the central defender dribbles forward and attracts the wide midfielder, its possible for Jesus to occupy the wide central defender and De Bruyne to push higher on the opposite side while Mahrez moves wider to evade the access of the defenders. Again, a common issue with back 3s is the lack of midfield presence, and so the far wide midfielder can shift inside extremely narrow to help negate the wide overload on the opposite wing. Another back 3 system. As the central defender progresses forward and both wide central defenders are pinned, there is a possibility to find the attacking midfielder evading into the wider areas. Similar issue to the last image, lack of central presence allows the opponent block to shift across in an extreme fashion as they can shift back to the other side in time should a switch occur due to their wide formation and no reason to be more compact in the center (therefore opening the wings). A back 3 with two central midfielders. Here the attacking midfielder can evade wide once again, but the rest of the midfield line of 4 can shift across and create a comfortable line of 3 covering the middle with assistance from the deep striker. The 3 central defenders allow the opponent far wide midfielder on the field to give more cover and support to the rest of his midfielders as they press the near side of the field. In this system the wide attacking midfielder could have more space and time than usual though as there are two central midfielders occupying the center of the field and so it would be a more difficult movement for the central midfielders of the opponent to move out to the wings – potentially a wide central defender could do it depending on the position of the central striker. Guardiola has used such a system in the past as well. Finally, a back 3 system with two central midfielders and 1 attacking midfielder. It would be difficult to find the attacking midfielder with this approach, especially as the far wide midfielder shifts inside to make the opponent more compact. More likely would be a lot of switching along the back 3 with difficulty to find a clean progression past the opponent midfield. 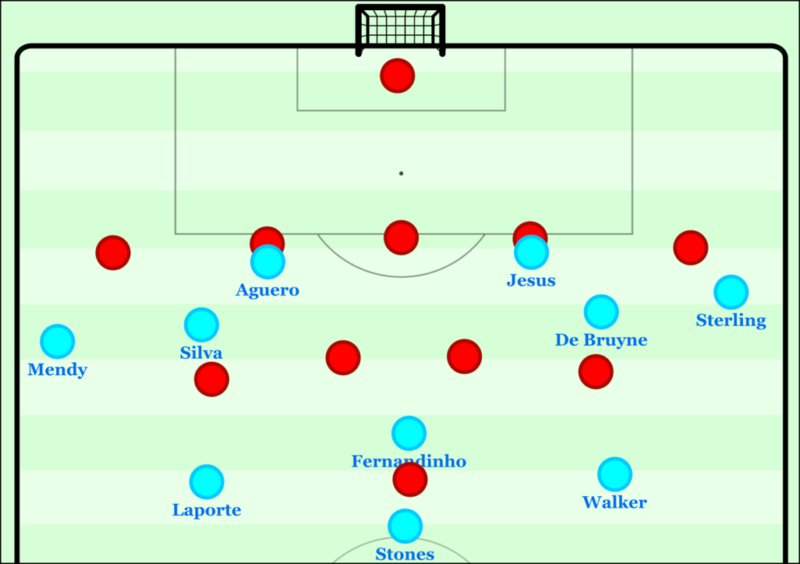 If City could dribble forward from central defense and the opponent is less compact in midfield, its possible to try and find the attacking midfielder or near defensive midfielder open. It’s more likely that the attacking midfielder would be covered and so the defensive midfielder could receive the ball, but struggle to break through the opponent. If the ball could find the attacking midfielder in the center it would be effective, but it’s hard to achieve that. Again, if the attacking midfielder drifted very wide he could have more time and space than usual, but some difficulty playing past the compact block. With which opponent did City play in this match? Because I can’t remember and I know that I watched. This is gold. City’s squad is so interesting because it has so much different quality filled with intelligent and complete footballers who can occupy different positions and roles. This whole article about breaking a bus has given me lots of ideas to try out in Football Manager (lol!). I can’t get enough of your stuff about Man City. Maybe this is a silly question but I want to learn so I have to ask. In the examples given, the defending wide midfielder is the one who presses the atttacking centreback who is dribbling the ball forward. Instead of that, why doesn’t the defending centre midfielder engage the centre back with the ball instead? Perhaps using cover shadow to block off access to the attacking midfielder (who is the one pinning) as he presses the centre back. The other defending centre mid can shift over to cover too. That way perhaps the ball gets shifted wide and the wide midfielder can then drift across and press, for example, Silva when he peels away into a wider area? Hope that question is clear. Thanks.